Many of us see a technology transition as simply that, a swapping out of one technology for another one. But, sometimes, a technology transition has much broader impacts and implications. We’ve seen that a bit with computers, especially as they have become more and more efficient and affordable, enabling better education, health services, transportation services, and economic growth in countless corners of the world. On a similar but perhaps even greater level, a transition to solar power and electric cars will transform the world. Energy is a basic need. Transportation is a basic need. Satisfying these needs, however, has resulted in massive wealth inequality. The supermajority send their money to essentially just a handful of super-rich people at the top of oil, coal, natural gas, and utility companies. The centralized nature of the energy industry today results in centralized accumulation of wealth. Non-renewable and non-local fuels require a huge potion of our household budgets. It is a constant, one-way stream of cash leaving our hands, and even the world’s poorest send their minuscule earnings to monopolists in order to burn kerosene for light. Solar power, cheaper than fossil fuels in the developing world and much of the developed world, can free billions from the continuous monthly or even more frequent cycle of wealth transfer. This clean form of energy offers not only power for our appliances, lights, and computers, but also social and political power. While the super-rich will lose influence, the poor and middle class will gain freedom and persuasiveness. 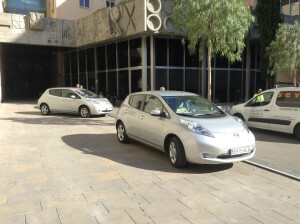 Electric vehicles bring this transition to another level. Again, we are currently sending trillions of dollars to the super-rich in exchange for fuel that we quickly burn. It is like throwing money down the drain. At the same time, that fuel we burn harms our health and shortens our lives. 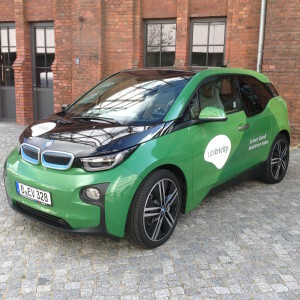 Electric cars, meanwhile, have zero emissions and can be charged with electricity from low-cost renewable resources such as solar and wind power. They again increase our energy independence and self reliance. The social and political ramifications are broad and considerable. It may take decades for this transition to play out. We may only slowly see how it changes our lives and our world, but one day, we will be able to look back and put the puzzle together quite clearly. ← Which Is An Extreme Diet? Zach, first of all a heartfelt thank you for Cleantechnica and your other web sites!! Extremely informative, helpful and inspiring. And I love the Rocky Mountain Institute vision of the central importance of deep conservation measures. I share your grand enthusiasm for solar and e-cars. Eventually, I see solar and wind integrated into the buildings and parking lots of cities where people live. As a consultant with the Green Parking Council, my latest vision is the match of one solar canopy (with 12 panels) for each U.S. car. The U.S. has 40,000 parking garages and 4 million acres of parking lots. These assets could support 200 million solar canopies with 2.4 billion solar panels. This coverage would run each of 200 million cars of an all electric fleet for 9,000 miles/year. The carports could also be sited at suburban and rural homes and farms. I value the great strides of utility scale solar and wind. We need all the help towards zero carbon that we can get. But distributed renewables seem to be lagging behind in penetration. Distributed energy is where the democratization of energy will take place. Large scale electric utilities so far have been mostly opposing or ineffective at implementing building conservation measures and distributed renewables. If current trends continue 75% of renewables will eventually come from utility scale solar and wind, leaving only 25% under more local and consumer control. This is not what I personally prefer, but what seems to be happening. Utility scale solar and wind are simply cheaper and quicker to site. My question: Given current trends, how do you guess that the puzzle of energy democracy will be solved?? I’d love you to do a follow-up article elaborating on this topic. Awesome. 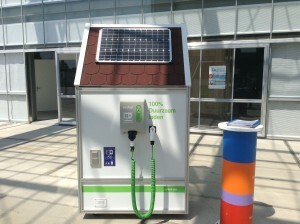 Solar canopies in parking lots is one of the most logical and ripe cleantech solutions, imho. Love your vision! I do hope to start a “big” cleantech tour to help with that goal. But it’ll just be one piece of a large, crowdsourced puzzle. I think all of us who get it just need to do like you and push for this democratization of power. And sure, I’d love to do a piece on this topic! I agree that utility scale is where we seem to be going. The basic fact is that most people (in southern california and even more so in the rest of the USA) don’t care enough about either saving money or the environment to install solar. It’s one more thing to do. It sounds like a scam when the salesy guys are pitching it…dunno. The challenge with solar parking canopies is that they increase the non-value add portion of the build cost by 30% due to the need for a new structure, permitting, etc. This is based on an installation we explored locally, in southern california. Rooftop installations are much more cost effective because they take advantage of an existing structure and really only need enough hardware to mount and wire the panels. Strangely, even ground mount installations are more cost effective. I attribute this to lower cost of build out as it does not have to adhere to the same safety regulations as a parking covering would and the benefit that you can install solar trackers which improve output by 20-40%, offsetting some of the extra build out required. Zach, thanks for article of today on the Model X and its tax incentives. But I fear you have misrepresented the actual benefit. The Heavy Vehicle tax provision you cite is a tax deduction, not credit. Therefore, the reduction in the price or cost of the model X goes down according to your tax bracket. So, if you are in the 30% bracket, the amount you save in taxes would be $7500, not $25,000. So the total reduction in cost, including the EV credit, would be about $15,000. Thanks. Saw that and got it fixed. You nailed it but the wealthy are pushing back by taking away the incentive to transition to solar power but jacking up grid connection fees with their sorry excuses that our neighbors are carrying the costs of the grid..never talking about the millions being pocketed in profits and bloated salaries..and the political pay-offs to hold on to their power and legislative advantages. We need some serious power backup to get us off the grid 100%. But then some law will be passed to make that illegal for some BS reason. Much has to change .. we have at least 80 houses in our community that are in perfect alignment for effective solar generation with rooftop solar panels (we generated just under 14,000 kWh last year from our 8.25 kw system) but we are one of three families taking advantage of that gift of nature and twenty-first century technology..